A class for performing multithreaded execution. Multithreaders are a class hierarchy that provides support for multithreaded execution by abstracting away platform-specific details. This class can be used to execute a single method on multiple threads or to parallelize an operation over a given image region or array. Definition at line 61 of file itkMultiThreaderBase.h. Definition at line 249 of file itkMultiThreaderBase.h. Definition at line 70 of file itkMultiThreaderBase.h. Definition at line 69 of file itkMultiThreaderBase.h. Definition at line 67 of file itkMultiThreaderBase.h. Definition at line 68 of file itkMultiThreaderBase.h. Definition at line 245 of file itkMultiThreaderBase.h. Definition at line 248 of file itkMultiThreaderBase.h. 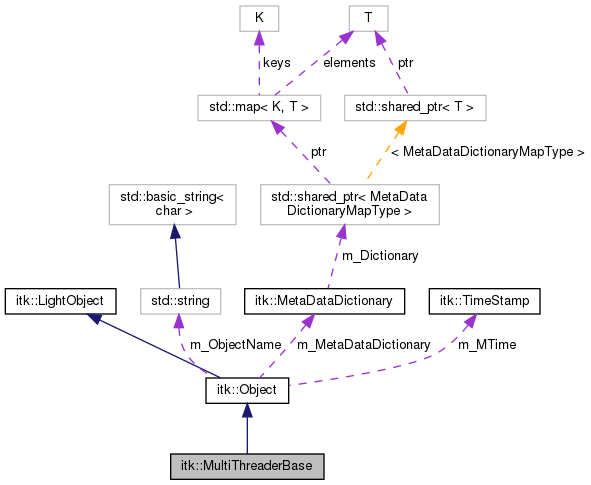 Currently supported types of multi-threader implementations. Last will change with additional implementations. Definition at line 112 of file itkMultiThreaderBase.h. The number of work units to create. Set/Get the value which is used to initialize the NumberOfThreads in the constructor. It will be clamped to the range [1, m_GlobalMaximumNumberOfThreads ]. Therefore the caller of this method should check that the requested number of threads was accepted. Set/Get whether the default multi-threader implementation. but it can only choose Pool or Platform multi-threader. as it introduces the biggest overhead. the developer's choice is respected over the environment variables. Set/Get the maximum number of threads to use when multithreading. It will be clamped to the range [ 1, ITK_MAX_THREADS ] because several arrays are already statically allocated using the ITK_MAX_THREADS number. Therefore the caller of this method should check that the requested number of threads was accepted. Get/Set the number of threads to use. It will be clamped to the range [ 1, m_GlobalMaximumNumberOfThreads ], so the caller of this method should check that the requested number of threads was accepted. 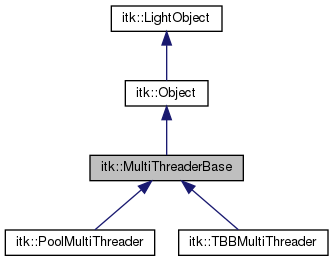 Reimplemented in itk::PoolMultiThreader, and itk::TBBMultiThreader. Get/Set the number of work units to create. It might be clamped to the range [ 1, SomeMaximumNumber ], so the caller of this method should check that the requested number of work units was accepted. Updates progress if progress is non-negative and checks for abort. If "abort generate data" is set, throws the ProcessAborted exception. Only used to synchronize the global variable across static libraries. Set/Get whether to use the to use the thread pool implementation or the spawing implementation of starting threads. Parallelize an operation over an array. If filter argument is not nullptr, this function will update its progress as each index is completed. This implementation simply delegates parallelization to the old interface SetSingleMethod+SingleMethodExecute. This method is meant to be overloaded! Break up region into smaller chunks, and call the function with chunks as parameters. If filter argument is not nullptr, this function will update its progress as each work unit is completed. Delegates work to non-templated version. Definition at line 267 of file itkMultiThreaderBase.h. References itk::ImageRegion< VImageDimension >::GetIndex(), itk::ImageRegion< VImageDimension >::GetSize(), itk::Size< VDimension >::m_InternalArray, itk::Index< VDimension >::m_InternalArray, itk::ImageRegion< VImageDimension >::SetIndex(), and itk::ImageRegion< VImageDimension >::SetSize(). Break up region into smaller chunks, and call the function with chunks as parameters. This overload does the actual work and should be implemented by derived classes. Similar to ParallelizeImageRegion, but do not split the region along one of the directions. If VDimension is 1, restrictedDirection is ignored and no parallelization occurs. Definition at line 293 of file itkMultiThreaderBase.h. References itk::ImageRegion< VImageDimension >::GetIndex(), itk::ImageRegion< VImageDimension >::GetSize(), HandleFilterProgress(), itk::ImageRegion< VImageDimension >::SetIndex(), and itk::ImageRegion< VImageDimension >::SetSize(). Set the SingleMethod to f() and the UserData field of the WorkUnitInfo that is passed to it will be data. This method must be of type itkThreadFunctionType and must take a single argument of type void *. Implemented in itk::PoolMultiThreader, and itk::TBBMultiThreader. Execute the SingleMethod (as define by SetSingleMethod) using m_NumberOfWorkUnits threads. As a side effect the m_NumberOfWorkUnits will be checked against the current m_GlobalMaximumNumberOfThreads and clamped if necessary. Static function used as a "proxy callback" by multi-threaders. The threading library will call this routine for each thread, which will delegate the control to the prescribed SingleMethod. This routine acts as an intermediary between the multi-threaders and the user supplied callback (SingleMethod) in order to catch any exceptions thrown by the threads. Convert a threader name into its enum type. Convert a threader enum type into a string for displaying or logging. Definition at line 118 of file itkMultiThreaderBase.h. Friends of Multithreader. ProcessObject is a friend so that it can call PrintSelf() on its Multithreader. Definition at line 427 of file itkMultiThreaderBase.h. The number of threads to use. The m_MaximumNumberOfThreads must always be less than or equal to the m_GlobalMaximumNumberOfThreads before it is used during the execution of a threaded method. Its value is initialized to m_GlobalDefaultNumberOfThreads at construction time. Its value is clamped to the current m_GlobalMaximumNumberOfThreads in the SingleMethodExecute() method. Definition at line 402 of file itkMultiThreaderBase.h. Definition at line 392 of file itkMultiThreaderBase.h. Definition at line 423 of file itkMultiThreaderBase.h. The data to be passed as argument. Definition at line 416 of file itkMultiThreaderBase.h. Definition at line 413 of file itkMultiThreaderBase.h.